I want one! Gimme nice job. How does one go about picking one of these? Use the force. I'm not sure about the New Gen, not sure what it has as far as extra securities, but the other bilocks you pick it like anything else. I found on the two that I have picked that one side will bind first depending on the direction you are applying tension, then after one side was set I got sort of a false set when the other side of pins started to bind. See those kids standing by the lake...drop some napalm and watch them bake. Naaapaalm...sticks to kids...it sticks to the belly and it sticks to the ribs. A discussion in the https://ssl.keypicking.com/chat/ room came up today about picking Bilocks so I thought an update was due on this thread. 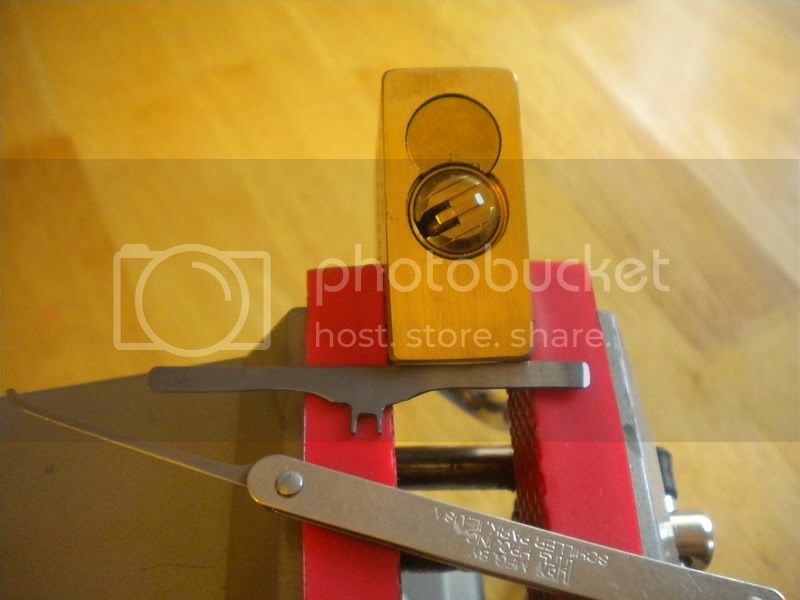 We were talking about the difficulty some people are having with breaking off the center "warding" post of the front of the keyway when heavy tension is applied. Farmerfreak came up with a solution to that problem, I hope he doesn't mind if I post it here. This invention is entirely his, I take no credit other than making this crude diagram in Paint to illustrate what I'm talking about. Perhaps he can post a pic of his tool in this thread as well. He came up with this wrench idea, made from a piece of an old, wide bandsaw blade. The prongs of the wrench are spaced slightly wider apart than the two halves of a Bilock keyway and I think that's the key to how this saves the center portion of the front plate from breaking off. Since the two prongs are a spaced wider, you have to tilt the wrench slightly to insert the prongs, one in each side, at the top of the keyway. 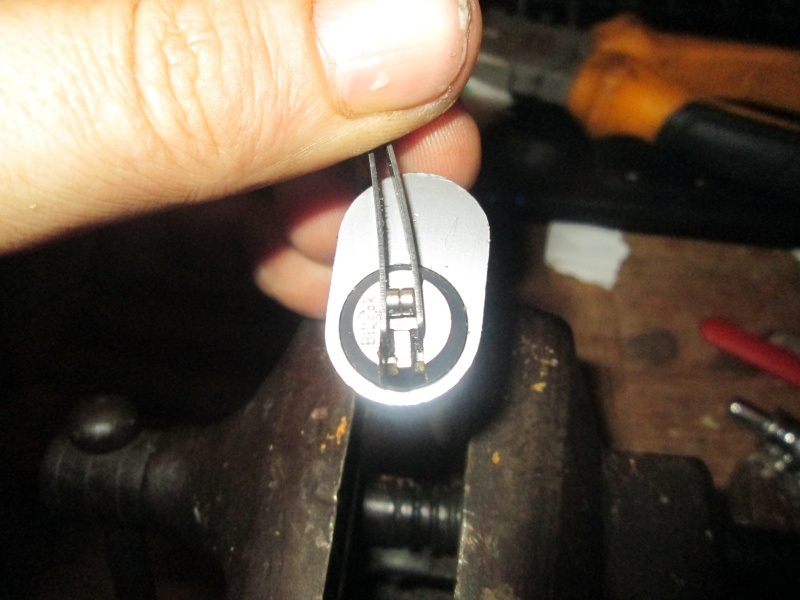 When tension is applied, each prong presses against the outer sides of the keyway, never touching the center portion that is susceptible to breaking. Please forgive the amateur artwork. 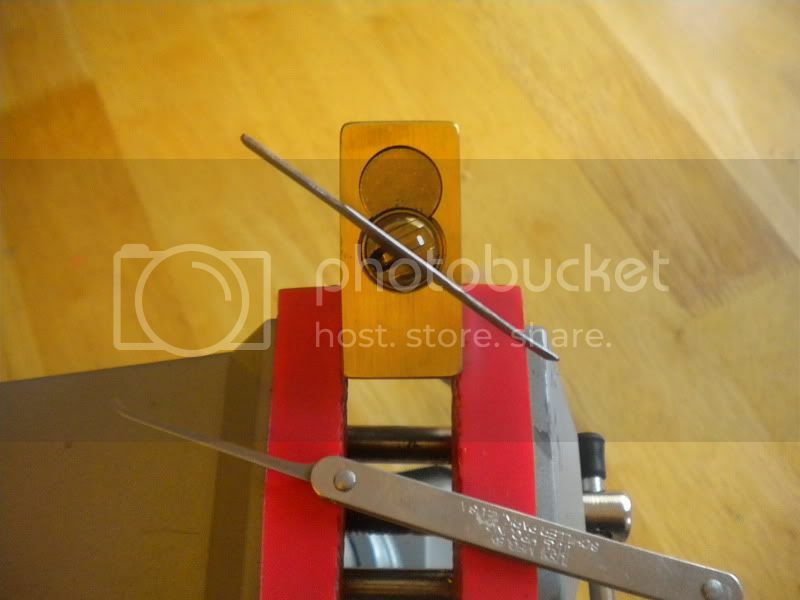 **Edit: On reading this post, xeo was quick to point out that if you have a Bilock which you've already broken off the center post so you've had to give up picking it, this wrench will allow you to give it another try since it works whether or not it even has the center post. Also, earlier in this thread someone asked if the first Bilock he picked was masterpinned. I later disassembled the core and there were two master pins in it. That may have perhaps made it slightly easier to pick, but he has since picked several other Bilocks, both original and New Generation which contained no master pins at all. In one, we did an unboxing video where a Bilock cylinder was ordered from a Bilock dealer, the package sealed with tamper-resistant tape. It was opened on camera and picked blind, with no cuts in filming and the lock never leaving the frame. If my memory hasn't failed me, this was the second or third Bilock he ever picked, it took a bit longer than the first one and as I recall the video is about 45 minutes long. By making use of those little ridges that run up the middle. I did this because the warding is very close to going and I didn't want to be the one who killed it! I believe the Falle tool uses the same principle to apply tension too. MBI already explained it, but here are some pictures of the tool.